The new Invite-on-Rez Script available now! 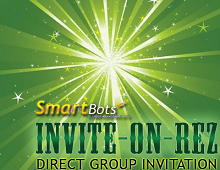 This script sends a direct group invitation when buyer rez your box. You can buy the script in SmartBots SL Store for L$5 only. The script is open-source, you can use it as-is or modify and distribute it freely. See documentation for more info!